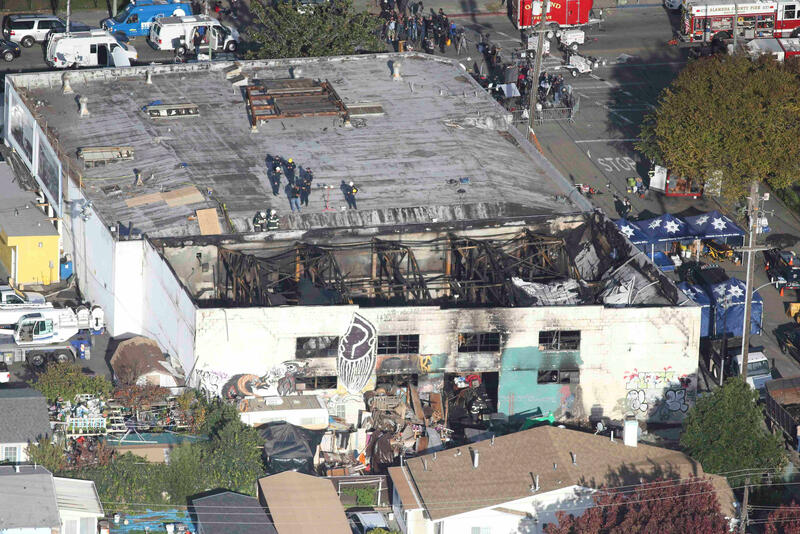 OAKLAND, Calif. – The search for bodies in the Oakland “Ghost Ship” warehouse fire was temporarily halted Monday amid fears of a building collapse, but not before the death toll officially rose to 36. The work was stopped overnight as engineers were called in to examine the structure. It resumed Monday morning once the situation was deemed safe. In addition to the fears about a building collapse, officials said they will be forced to shut down electricity to up to 1,000 neighborhood customers as a large crane is brought in to the help in the recovery. Oakland Fire Battalion Chief Melinda Drayton said first responders noticed late last night one of the brick walls of the building was leaning in at least a few inches, so they decided to stop their work. CBS News correspondent Carter Evans reports the building’s exterior is mostly made of brick but the interior was mostly wood, which is now mostly burned away, leaving the rest of the structure vulnerable. After saying the number of victims had officially hit 36, Drayton warned they expect to recover more bodies still. So far, only a handful of the victims have been publicly identified. A cause of the fire has not yet been determined. Officials have opened a search for potential criminal activity, but no charges have been announced yet. Officials told CBS News that crews have only searched through roughly half of the charred warehouse so far. “We’re finding people throughout the entire square footage of that structure,” Alameda County Sheriff’s Office spokesman Sgt. Ray Kelly said. Oakland fire victim's father: "It feels so painful right now"
Video posted from inside shows a party going on just before the fire broke out. The warehouse had been converted into an eclectic live-work space for artists. Not much is left. Officials said they came to inspect the property last month. “All that I know is that we were not able to gain access to the interior of the building,” Oakland Mayor Libby Schaaf said. Max Ohr told CBS News he lived at the artists collective for the past two years and helped host Friday’s event, and that he never saw any inspectors visit the place. “If there were, we would have let them in,” Ohr said. CBS News reached out to the building’s owner for comment, but have not yet heard back. Her daughter told the Los Angeles Times they believed the building was only being used as an art collective. An Oakland city councilman said the building was never permitted as a residence and was under investigation. Meanwhile, the federal Bureau of Alcohol, Tobacco, Firearms and Explosives is at the scene helping with the investigation. Meanwhile, bouquets of sunflowers, single white roses, lilies and carnations were stuck in chain-link fences around the building Monday morning, as votive candles burned on sidewalks and post-it notes paid tribute to the Oakland fire missing and the dead in the most lethal building fire in the U.S. in more than a decade. For many, the incident has called to mind the Station nightclub fire in Rhode Island in 2003 that killed 100 people, the Kiss nightclub fire in Brazil in 2013 that claimed 246 lives, and last year’s Colectiv nightclub fire in Romania that left 64 people dead. “While we still don’t know the full toll of this disaster, we do know that an American community has been devastated, and many people – including young men and women with their whole futures ahead of them – have tragically lost their lives,” Mr. Obama said. Kai Thomas and a group of red-eyed classmates from an arts high school in San Francisco pressed against police tape Sunday near the street corner where the “Ghost Ship” rapidly went up in flames late Friday, taking the life of a friend. They wouldn’t give his name, but the victims included a 17-year-old, as well as people from Europe and Asia and some over 30. Officials had identified 11 of the dead — at least seven of them using fingerprints, but told family members of the missing that they may need to use DNA for more difficult identifications. The district attorney’s sent a team to search for signs of a crime in the warehouse that was already under investigation by the city for possible code violations. The space was only permitted as a warehouse and neighbors had complained of trash piling up and people were illegally living there. The family’s three children had lice and needed new clothes, prompting family to call child-protective services, said Michael Allison, who wept as he talked. But Almena and his partner eventually were able to win custody of the children back and cut off all communication with Michael Allison, the father said. A man identified as Derick Ion posted a Facebook message early Saturday, saying, “Everything I worked so hard for is gone. Blessed that my children and Micah were at a hotel safe and sound.” He drew rebukes online from others who said he was warned the building was unsafe.